Although The Greens MPs have used the fig-leaf of a leaflet endorsed by Lee’s office to attack her, they have now admitted that it is the NSW Greens’ ability to bind how MPs vote that is their real target. In an email to all Greens members, Senator Rachel Siewert said that the party room meeting would exclude Lee from all contentious discussions and issued a, “request that National Council work with Greens NSW to end the practice of NSW MPs being bound”. This is the latest episode in a long-running effort to squeeze out the more left-wing elements within the NSW branch of The Greens. After last year’s federal election, former MP Bob Brown took to the national media declaring, “They need a clean out in NSW”, following a small drop in the party’s vote. He even demanded Lee Rhiannon resign the seat she had just won in the Senate. This week there have been a series of leaks aimed at discrediting Lee, including the myth that she had already been censured twice by the party room in the past. Journalist Fran Kelly has now confirmed on Radio National that the claims came from Richard Di Natale’s office. At the heart of the division is the desire of Richard Di Natale and the bulk of the Greens Senators to fully embrace parliamentary deal-making and move the party to the right. 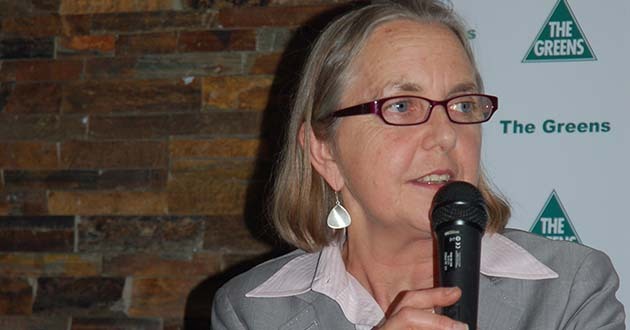 Lee Rhiannon and the left in the NSW Greens are seen as an obstacle to this path. Rhiannon was instructed by members of her NSW branch of the party to vote against Turnbull’s Gonski 2.0 schools funding package. This infuriated other Greens Senators, who were trying to cut a deal with Turnbull to support the legislation. Lee was absolutely right to call for a vote against Gonski 2.0. It delivers $17 billion less funding that the original Gonski package had on the table, and locks in billions in funding for private schools. Under the plan the federal government would fund 80 per cent of the “school resourcing standard” for private schools and just 20 per cent of the standard for public schools. The party room have tried to present the act of binding MPs as some kind of breach of faith that makes it impossible for them to operate in Parliament. But in fact it is about parliamentarians being bound by party policy and being accountable to the party members and the people who voted for the party. This is a basic issue of democracy that ensures it is the party as a whole that sets policy, not just a handful of MPs. Parliament is a ruling class institution, which exerts conservative pressures on MPs to compromise with the existing political framework. In its early years, before its long move to the right, the Labor Party often had to fight its own MPs to insist they implement party policy once they were elected to parliament, rather than do compromising deals with various right-wing parliamentary parties. Without proper accountability to the party membership, MPs are pulled to the right, and bend or break party policies in the name of pragmatism, or as Richard di Natale puts it, “achieving outcomes”. Never mind that the outcomes go against party policy. In calling for an end to the NSW Greens’ ability to bind their MPs, the party room has issued an ultimatum to the whole NSW branch. But their real target is the left. The right (both federally and in NSW) is clearly preparing to make sure Lee does not stand at the next federal election as a Greens Senator, and to ensure a right-wing candidate from NSW replaces her. Last year the left in NSW lost two pre-selection contests for seats in the NSW parliament to right-wing Greens candidates. It was the increasing aggressiveness of the right that led to the formation of the Left Renewal faction in NSW earlier this year. The question posed by the Party Room’s ultimatum goes to the heart of party democracy and principles. Are The Greens going to unequivocally stand for their principles, like defending public education? Or, should their MP be able to wheel and deal, and trade off principles for pragmatism? Had The Greens done a deal with Turnbull and voted for Gonski 2.0 it would have been a serious mistake. This would have been a Democrats moment. The party would have alienated a huge number of members, teachers, unionists, and parents who want to see it take a stand against Turnbull for fully funded public education. It was tragic to see all the federal Greens MPs line up against Lee over Gonski 2.0. It was similar opportunism that killed off the Democrats. If the Greens party room gets its way, The Greens will resemble more and more the mainstream parties they have stood against. Winning minor concessions through negotiations with the government is not what built The Greens’ support. This has come through principled stands for refugees and the environment and against neo-liberalism. Jeremy Corbyn’s success in Britain is an example of the kind of support that can be won by standing on principles. The federal party room has thrown down the gauntlet. Unless the left in the NSW Greens starts to organise, to defend Lee and defend the NSW branch, the right will bulldoze them out of the way. That would be a blow, both for The Greens, and the wider left as well.